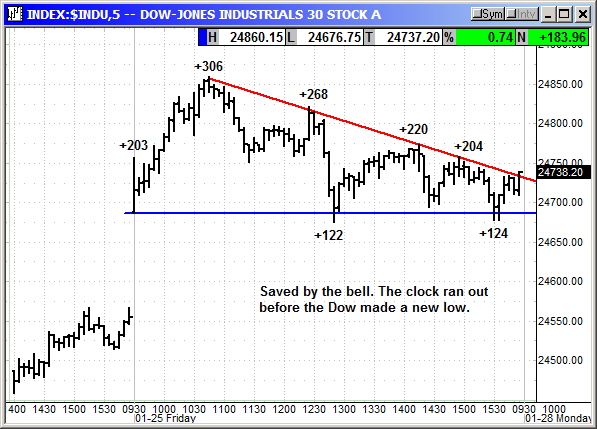 Time on the clock expired before the Dow could slide into the loss column for the week. 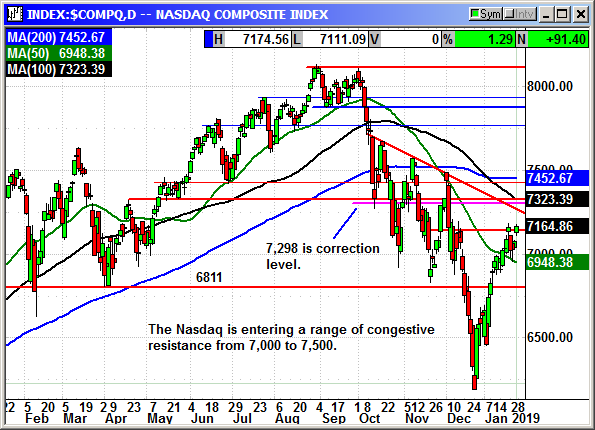 The Dow gapped up to +306 at 10:30 but faded the rest of the day as the various headlines impacted the market. 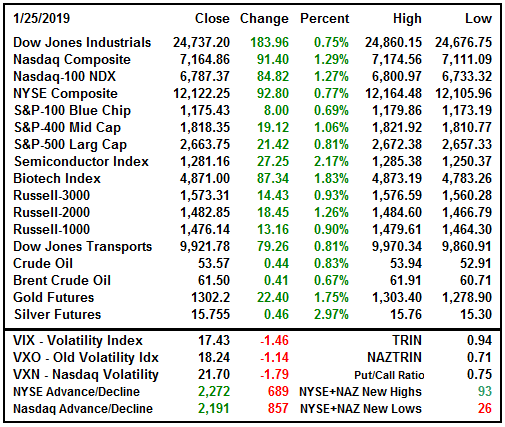 The temporary shutdown at LaGuardia, the arrest of long time Trump friend Roger Stone, the hourly updates on the government shutdown and the impact of earnings all weighed on the index. 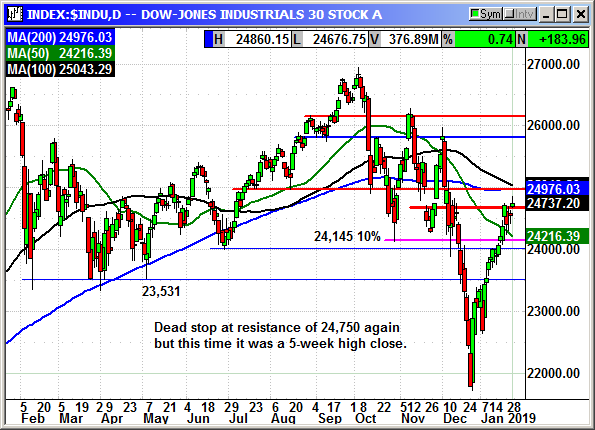 The Dow finished the week with a 30-point gain but that was a plus given the sharp declines early in the week. 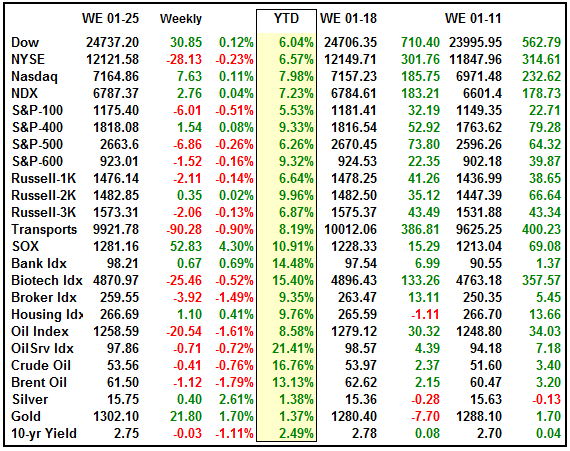 The Dow, Nasdaq and Russell stretched their weekly gains to five weeks, but the S&P ended its streak with a loss of 6 points for the week. There were no economic reports on Friday. The durable goods orders for December and the new home sales were postponed by the government shutdown. Late Friday afternoon the president, house and senate agreed on a temporary bill to reopen the government until February 15th to let 800,000 workers return to their jobs, receive their back pay and at least one more paycheck before another potential shutdown on the 16th. As part of the deal a conference committee was formed to work out a solution acceptable to all parties over the next three weeks. The bill was signed by President Trump late Friday to officially reopen the government. 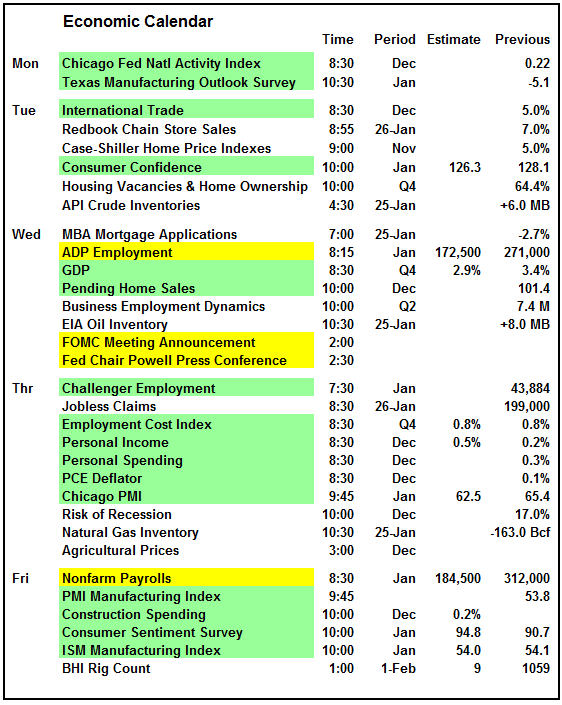 One of the first reports for next week will be the Q4 GDP, with the analyst consensus at 2.9% growth. 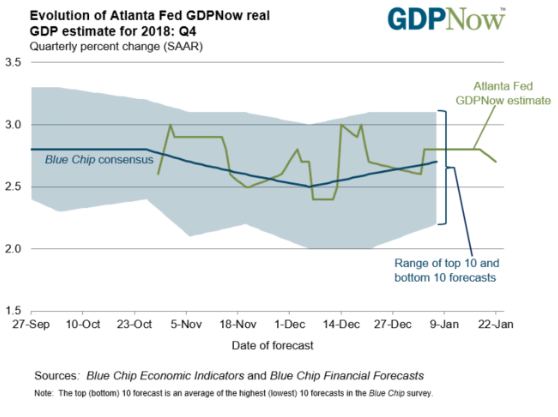 The Atlanta Fed real time GDPNow forecast is currently 2.7% growth. The tariffs on China are thought to have removed several tenths from Q4 but anything over 2.5% growth is still a respectable number. The Q1 GDP is going to be impacted by 0.5% to 0.7% from the government shutdown. The headline event for next week is of course the FOMC decision on Wednesday and the Powell press conference. There was some "messaging" last week about a potential slowdown in QT if the data supported it. 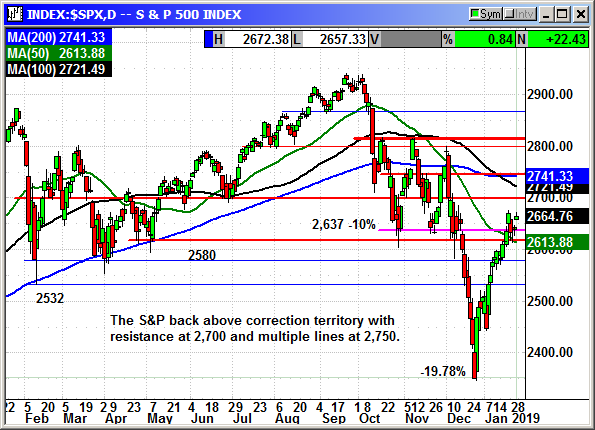 This is another change in the posture for the Fed suggesting they got the message from the market. With Mario Draghi warning about a continued slowdown in Europe and the potential for a hard Brexit, there may have been some communication between the central bankers and Powell is being preemptive in his messaging. For this reporting cycle 112 S&P companies have reported Q4 earnings with average growth of 14.3% and 5.6% revenue growth. More than 72% of companies have beaten on earnings and 58% have beaten on revenue. 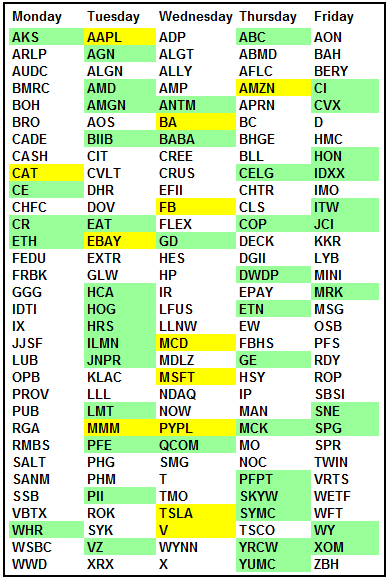 More than 125 S&P companies report next week. 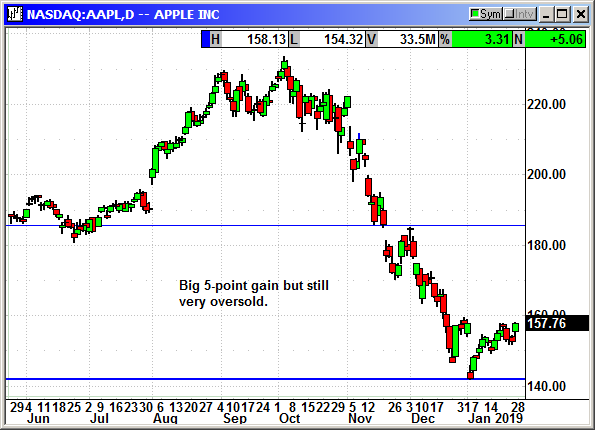 Apple is the first big cap tech stock to report on Tuesday and this will be a "hold your breath" report. The analyst community is evenly split between "all the bad news is priced in" and "they are going to miss even the revised guidance." With hardly a day going by over the last two months without an Apple supplier warning or an analyst downgrading the stock, there is a lot of bad news for sure. I am worried that when faced with weak phone sales they may guide even lower in hopes of beating Q1 estimates rather than be forced to warn again mid quarter. You know the old saying, "under promise and over deliver." Apple has a monster impact on the tech sector because of all the suppliers. When you have one company consuming $30 billion in parts every quarter, every little cut in production causes big ripples. 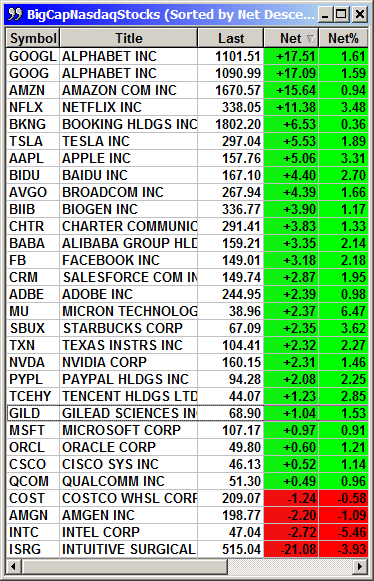 Wednesday is stuffed with big names with Facebook, Boeing, McDonalds, Microsoft, PayPal, Tesla and Visa. Facebook will be the most watched to see if they are going to guide lower because of the 10,000 social media screeners they hired to police posts. How much are those costs going to impact earnings? Will there be charges for litigation both existing and expected? Has their advertising revenue taken a hit from all the privacy violations? Compared to Apple and Facebook, Microsoft will look like an old reliable tortoise as it plods slowly along creating annual investor wealth rather than consistent quarterly gains. Microsoft has a lot of new initiatives underway and their earnings call could be exciting. Lastly, Amazon reports on Thursday and nobody is expecting any surprises. That makes this dangerous. The biggest surprise normally comes when you are not expecting it. I think most investors will be interested in how Jeff and Mackenzie Bezos are going to split the 16% of the company that Jeff owns. Investors would love to hear that a settlement has been previously agreed and Mackenzie will get X% but Jeff retains the votes. 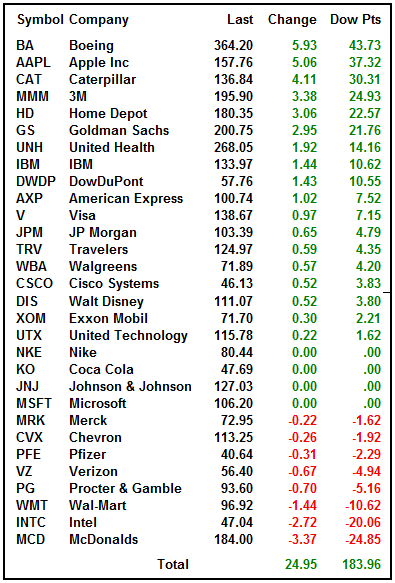 There are 13 Dow components reporting earnings. 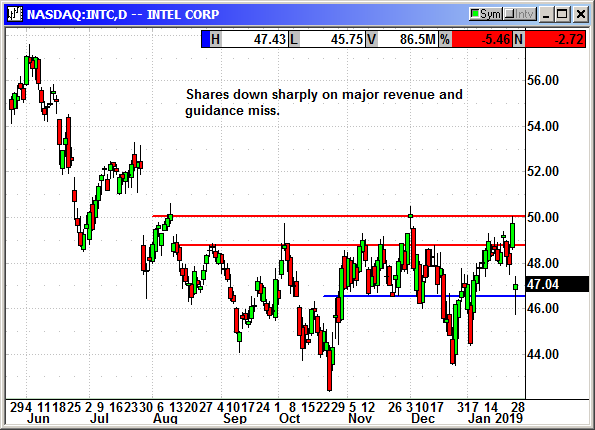 Intel (INTC) was a 20-point drag on the Dow on Friday after missing on revenue estimates and posting weak guidance. Intel posted earnings of $1.28 that beat estimates for $1.22. Revenue was $18.7 billion, and analysts were expecting $19.01 billion. Overall earnings rose 18% while revenue rose 9%. The company guided for Q1 earnings of 87 cents on revenue of $16 billion. Analysts were expecting $1.01 on revenue of $17.37 billion. It was a major guidance miss. They guided for the full year for earnings of $4.60 on revenue of $71.5 billion and analysts were expecting $4.55 and $73.25 billion. Intel's revenue growth rate in the cloud division declined from 50% to 24% YoY. That is a major challenge. Large cloud providers like Amazon, Google and Microsoft are customizing their own chips and servers and some have begun adding processors from AMD now that they have the newest technology. JP Morgan reiterated an overweight rating saying despite current weaknesses in cloud and modems, the second half of 2019 would be an inflection point. This is when they will begin to deliver some of their newer chip architecture and could regain some market share. Shares fell 5.5% and closed $1.25 off the lows with a loss of nearly $3. 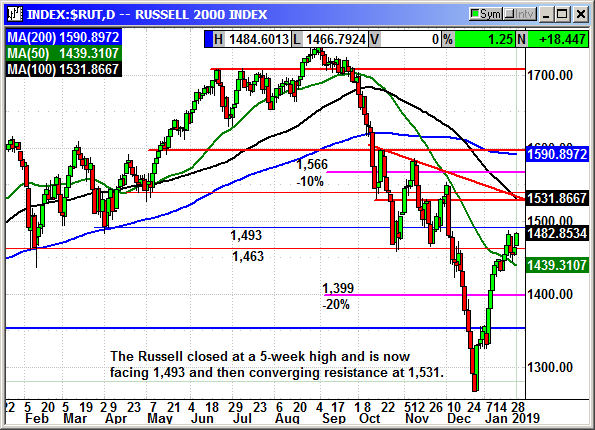 With decent resistance at $50 it is likely to be a while before it moves over that level. 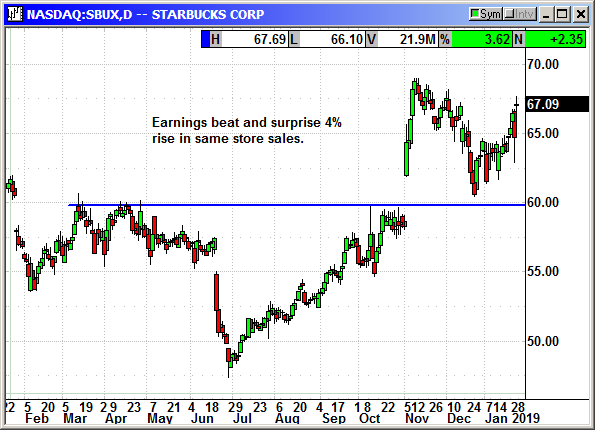 Starbucks (SBUX) shares posted a decent gain on Friday after the company reported earnings of 68 cents that beat estimates by 3 cents. The big news was the 4% rise in same store sales that beat estimates for a 2.8% rise. The company said the return of holiday drinks had lifted sales. Who knew Peppermint Mochas and Gingerbread Lattes would be so popular? They said afternoon sales were the best in five quarters thanks to new drinks and food options. They now have more than 2,000 stores in China in 30 cities. Here is the kicker. If holiday drinks spiked same store sales in Q4, what will happen in Q1 when those drinks are no longer popular and leave the menu? Are they setting up for an earnings miss? 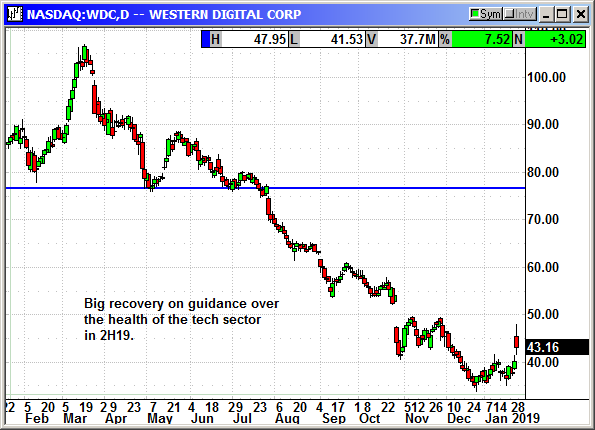 Western Digital (WDC) reported earnings of $1.45 per share that missed estimates for $1.49. Revenue fell from $5.34 billion to $4.23 billion and missed estimates for $4.25 billion. Shares fell more than $2.50 in afterhours on Thursday. However, even though they posed weaker guidance on the conference call shares spiked $11 from the afterhours low of $37.50 to the opening high at $47.95. The company guided for current quarter revenue of $3.6-$3.8 billion and earnings of 40-60 cents. Analysts were expecting $3.88 billion and 97 cents. The company said the weakness came from a slowdown in high end smart phone sales with lots of memory. They expect that trend to fade in 2H 2019 when another model year for dozens of even larger memory phones will debut. They also forecast a resurgence of cloud buying as cloud computing companies return to more normal buying patterns. The company is also targeting $800 million in cost reductions and those cost reductions will outpace price declines in 2H19. They also blamed the weak earnings on a major slowdown in China in a repeat of comments already heard from other tech companies. 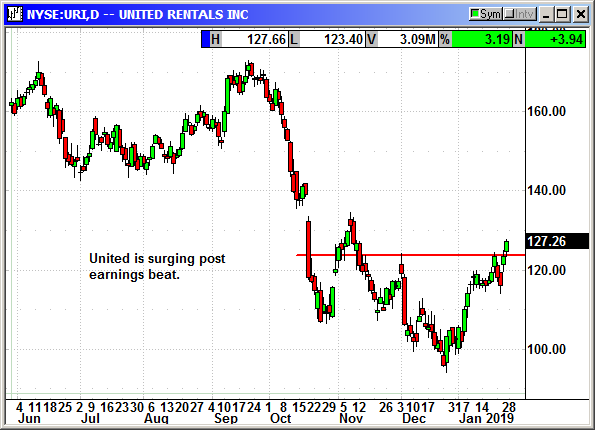 United Rentals (URI) reported earnings on Wednesday that beat estimates. 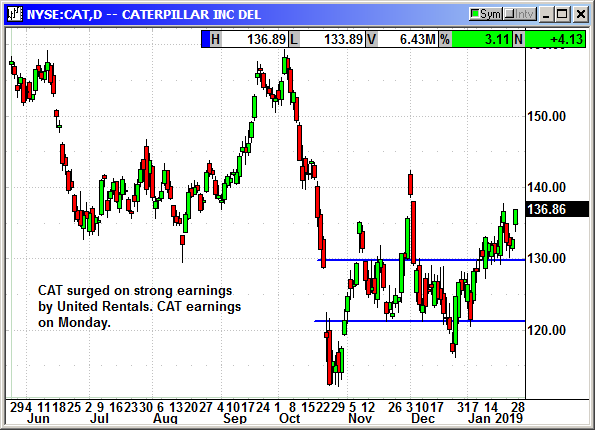 Their earnings beat and positive guidance could be a good sign for Caterpillar's earnings on Monday. United saw rental revenue rise 21% to 86% of its total revenue. Overall revenue rose 20% to $2.306 billion. If the rental business is booming, we should expect to see equipment sales rise as well. This rental equipment is not cheap and rental prices rose 2.2% for the quarter. Caterpillar is expected to show positive gains in North America, but it will be China in focus. With the monster Belt and Road initiative in China covering 60 countries and costing between $4-$8 trillion, there is going to be a huge demand for earth moving equipment for the next 20 years. They are proposing thousands of miles of highways, railroads and electrical infrastructure to support commerce along those routes. I would not buy and hold Caterpillar today just because of this mammoth project but it will be a source of high demand for years to come. Worries over trade, the government shutdown and the messaging from the Fed on tapering QT all weighed on the dollar on Friday. 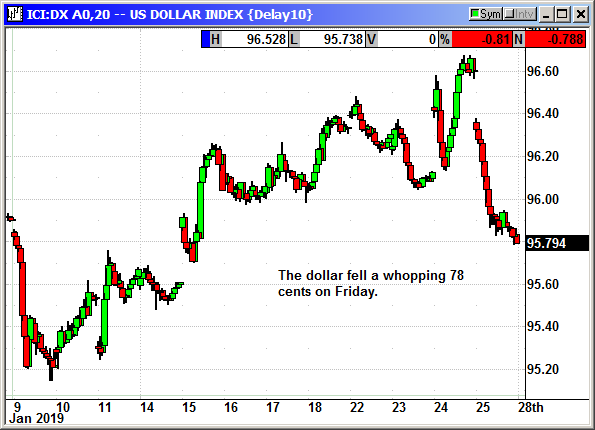 The Dollar Index fell a whopping 78 cents and that powered gold and silver higher. 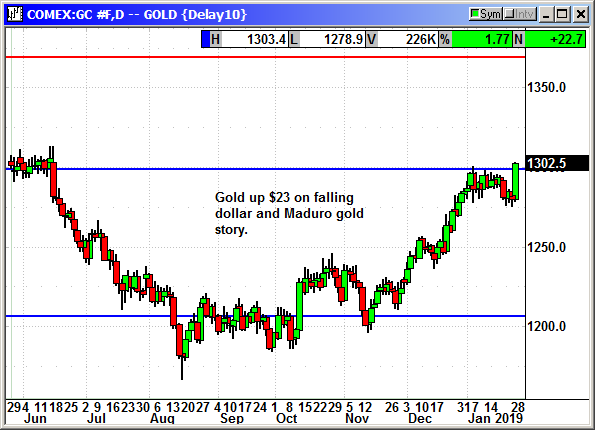 Gold prices shot up nearly $23 on the drop in the dollar. Also attracting attention to gold was Venezuelan president Maduro trying to get his hands on $1.2 billion in gold held by the Bank of England. As many countries have now recognized the opposition party leader as the rightful president of Venezuela, Maduro is trying to extract some hard currency with inflation in Venezuela up 80,000% in one year. If he is heading for a remote island paradise getaway now that his socialist gig is up, he will have to get his gold elsewhere. The Bank of England denied his request to remove Venezuelan gold from their vaults. 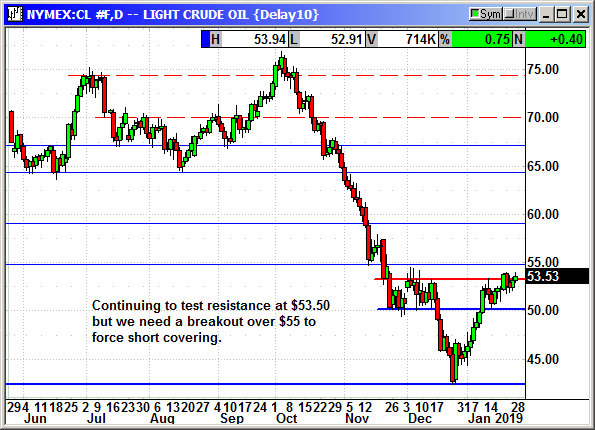 Crude prices are back over $53, helped by the falling dollar but hurt by rising inventory levels. 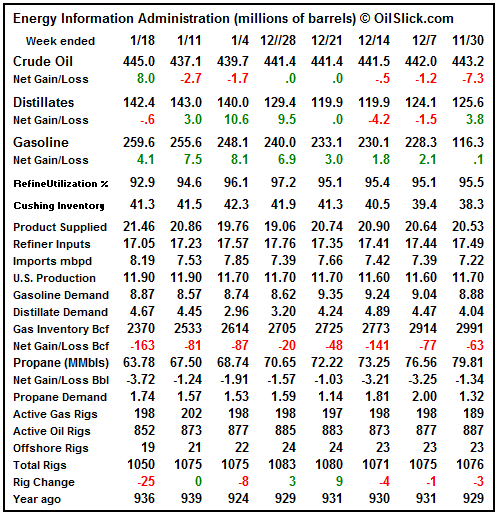 In the US, inventories rose by 8.0 million barrels last week. Imports rose by 660,000 bpd to the highest level in four months. With President Trump threatening to cut off imports of Venezuelan oil, refiners have been loading up on the heavy sour crude that converts better into diesel and distillates. If sanctions are incurred, they will have to acquire this from the Middle East and Saudi Arabia is pressuring other OPEC nations not to sell to the US in order to keep our overall inventories lower. WTI is priced on our inventory levels. Sanctions on Venezuela will increase our oil prices. 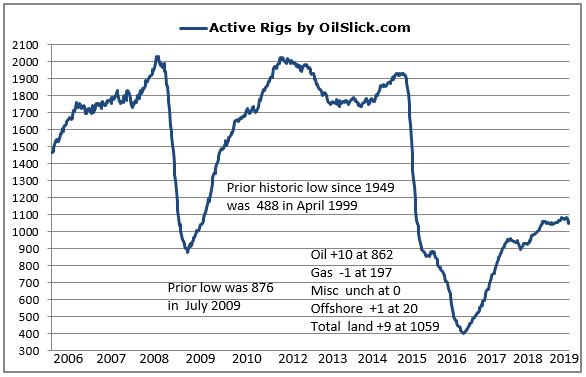 Active rigs rebounded from the loss of 25 the prior week with 9 rigs going back to work last week. With oil prices still relatively low, there is not likely to be any rush to put rigs to work. "The more people who own little businesses of their own, the safer our country will be, and the better off its cities and towns, for the people who have a stake in their country and their community are its best citizens."